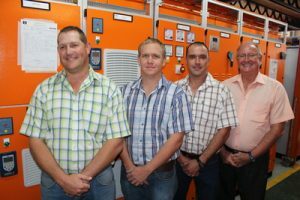 JB Switchgear Solutions was recently awarded two multimillion Rand contracts by Petra Diamonds for the design, manufacture and supply of motor control centres (MCC’s) to their Cullinan and Finsch Mines respectively. The primary purpose of the C-Cut Phase 1 project is to extend the life of mines and to ramp up the rate of mining. The scope entails two areas. Firstly, the development of infrastructure to mine the new C-Cut Phase 1 block which consists of eleven million cubic metres of ore. Secondly, the deepening of the two existing shafts. The Rock Shaft will be deepened by 354 metres, and the Men Material Shaft by 80 metres. The winders and headgear will be upgraded to handle the increase in tonnages. JB Switchgear scope include ten (10) ‘Eagle’ series motor control centres containing over two hundred DOL starters ranging between 10kW and 200kW. In addition, a number of variable speed drives (VSD?s) between 18.5kW and 160kW were installed, as well as soft starters ranging between 160kW and 200kW. Incomers up to 2500A were provided, and the communication protocol used is Profinet.At Finsch mine, the Run of Mine (ROM) production will be increased from approximately 2.9Mt/a at present to 3.5Mt/a while carat production will move up from 1.88 Million carats to around 2 Million carats. JB Switchgear’s scope in this instance include five (5) ‘Eagle’ series motor control centres which include over seventy DOL starters between 0.37 kW and 200 kW, as well as a variety of variable speed drives (VSD’s) and soft starters ranging between 30 kW and 220 kW. Incomers are rated at 1600A. Here also, the client chose Profinet as the communication protocol. JB Switchgear’s ‘Eagle’ series of assemblies carry type test certification for compliance with IEC 61439/SANS 1973-1 and IEC 61641 standards. The design is well proven, robust and user friendly, with more than thirty thousand tiers installed globally. JB Switchgear is also ISO 9001-certified for their quality management system.